Philadelphia Flyers goaltender Michal Neuvirth makes a glove save against the Buffalo Sabres last month. Just when it seemed like things were going well for the Flyers, who have won four straight games and recorded a point in 13 of their last 17, fans got some rough news Tuesday evening when the team announced that starting goalie Brian Elliott will miss the next five to six weeks after undergoing abdominal surgery. The 32-year-old sustained the injury in the Flyers shootout win over the Coyotes on Saturday night. Elliott, who signed a two-year deal in the offseason, is 21-11-7 with a 2.72 GAA and .908 save pct. this season. Moreover, he's been a major reason for the Flyers' turnaround over the last two-plus months. Since the team snapped it's 10-game winless streak back on Dec. 4, Elliott's been one of the hottest goalies in the NHL, posting a 15-5-1 record, a 2.51 GAA and .912 save pct. – and in the process helped the Flyers, 20-8-2 overall since Dec. 4, go from last place in the Metropolitan Division all the way to the third playoff spot. They'll have to hold on to that spot, at least for the next five weeks, without their starting goalie. Instead, it'll be the guy who replaced Elliott in Saturday's shootout and closed out the win: backup Michal Neuvirth. In 18 games this season, Neuvirth is 7-7-2 with a 2.50 GAA and a .917 save percentage. "It’s certainly not what you want, [to see] one of your players, and obviously an important player for us to this point, get hurt," said Hextall, who also confirmed the injury is related to what sidelined Elliott around the All-Star brea. "What it does is give someone else an opportunity – we believe in Michal Neuvirth. We signed him because we believed in him. He showed at times that he’s a very good goalie so hopefully Neuvy can take the assignment and do a good job for us." The Flyers (28-19-9, 65 points) still have time to add some help before the February 26th NHL trade deadline, and while Hextall said the organization is confident in Neuvirth, he wouldn't rule out a possible deadline deal. "Well, the deadline is two weeks away. I guess things can change between now and then, but we like our team, we like what we’ve done," Hextall said. "In saying that, we’ve got to keep going here, we’ve got to keep pushing. Neuvy is very capable, again, he’s played some real good games for us this year, some other ones that haven’t been that great, but if he can get on a roll here and get some consistency and do a good job for us, we will be fine." Neuvirth, 29, has been solid in relief of Elliott this season, just like he was for Steve Mason before him, but one reason the Flyers could seek outside help has his inability to stay healthy. He's missed big chunks of time in the past, including twice last season (knee, illness). "Is it a part? I guess if you think about it – we always do [factor in his injury history]; we’re signing him, we’re thinking about it," Hextall said. "But I think whenever you get down on two goalies and you’re down to one, I think you’re a little bit nervous no matter what." Backing up Neuvirth will be Alex Lyon, a 25-year-old rookie who was called up from the Phantoms prior to Sunday's win over Las Vegas. 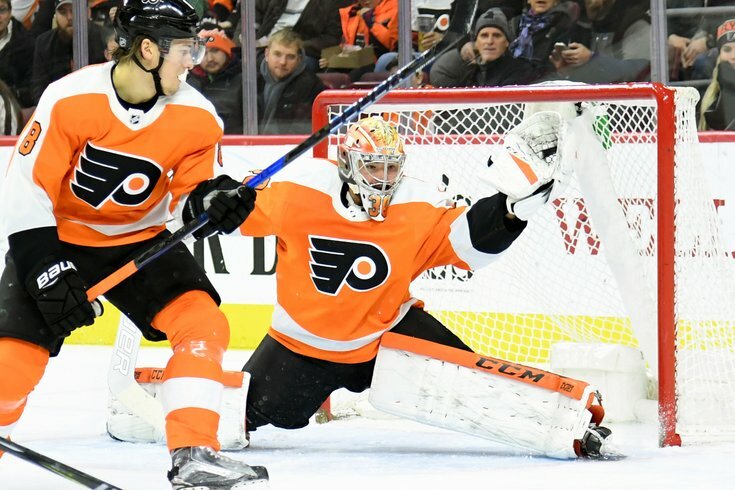 "Alex Lyon played very well lately in Leigh Valley and obviously at some point here he’s probably going to have to give us some minutes," Hextall said. "So we believe in both guys and we will get through it." Anthony Stolarz, who was expected to be the backup this season before tearing his meniscus in September, could also return at some point in March, according to Hextall. That however, will depend on how the final stages of his rehab play out over the coming weeks. With Elliott's injury expected to keep him sidelined for another 20 or so games following Tuesday night's game against the Devils, and the Flyers currently holding one of the Eastern Conference's playoff spots, making a move to shore up their goaltending situation would seem to make sense. And while Hextall said the team would go with Neuvirth and Lyon for the time being, he more than left the door open. "I can’t say I will go with the 23 guys on our roster right now. I don’t know what is going to come up," Hextall said. "I’ll repeat what I always say, if we can make our team better in any position, you know we will look at it." According to TSN's Elliotte Friedman, there could be something cooking between the Flyers and the Sabres, but we'll have to wait and see whether that smoke turns into fire.